The history of famous Sancy diamond is very involved, and probably in the various stories two or more stones have been confused. Sancy is a 55 carats, pale yellow diamond, with almond-shaped cut, covered with tiny facets on both sides. Due to its cut and shape it is believed Sancy comes from India. Sancy has rather unclear story but by devious ways it eventually comes into the hands of Nicolas de Harlay, seigneur de Sancy who was then French Ambassador to the Ottoman (Turkey). Henry III of France suffered from premature baldness and tried to conceal this fact by wearing a cap. 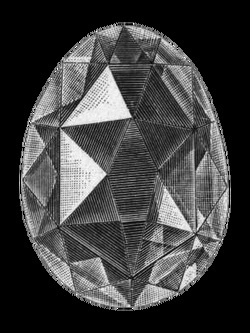 As diamonds were becoming increasingly fashionable at the time, Henry arranged to borrow de Sancy's diamond to decorate his cap. Henry IV also borrowed the stone, for the more practical purpose of using it as security for financing an army. In 1695, the stone was sold by James II to Louis XIV of France for 625,000 francs (about £25,000). It appears in the inventory of the French regalia made in 1791, where it was valued at 1,000,000 francs but was stolen on 17 August 1792. The stone was next heard of in 1828 when it was sold to Prince Demidoff for £80,000. It remained in the Demidoff family collection until 1865 when sold to Sir Jamsetjee Jeejeebhoy, an Indian prince, for £100,000. He sold it only a year later, creating another gap in its history. It reappeared in 1867, displayed at the Paris Exposition, carrying a price tag of one million francs; the gem then vanished again for forty years. The Sancy next appeared in history when bought by William Waldorf Astor, 1st Viscount Astor in 1906. Astor family possessed famous Sancy diamond for 72 years until the 4th Viscount Astor sold it to the Louvre for $1 million in 1978. 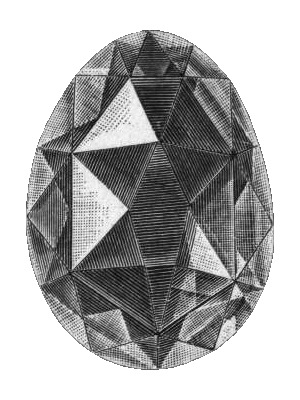 Today famous Sancy diamond is exhibited in the Apollo Gallery, at the Louvre museum Paris. "Sancy (diamond) black" by Ahnode - Nordisk familjebok. Licensed under Public Domain via Commons.